This week the primary season brings us to two very different states, each of which are a source of creative inspiration but in very different ways. The first of these states we will visit is Arizona. We begin where we left of in Colorado. From Four Corners, we head west on US 160 through the Navajo Nation. The dry landscape is punctuated by red rock formations such as Baby Rocks, which can be seen along the highway. The shapes and textures of the rock formations and the sparseness of the landscape are what attract me to the southwest. The unique combinations of climate, water and rock composition lead to this landscape, and individual varieties of rock (many of which are different types of sandstone) lead to the distinctive shapes in different locations. Sometimes the most interesting can simply be found on the side of the road. But that does not detract from the many iconic parks in this state. Indeed, if we continue on US 160 west to its terminus at US 89, and then further west along State Highway 64, we come to the most iconic of all, the Grand Canyon. It’s quite hard to summarize the Grand Canyon in such a brief article, but to say that it is most defined by its vast size. One is not simply looking at a large rock formation, but an entire carved landscape that extends in all directions. The space left by the canyon is big enough to support the same atmospheric effects as the sky itself, such as the refraction that leads to a blue tint in the space. Sadly, this also makes it a magnet for air pollution. The scale also means that from a distance one sees the rough surface and curved lines of the overall topography, but not as many distinctive formations like the Baby Rocks described above. To see such details of the Grand Canyon, one must travel to the far sections of the rim or descend into the depths. For many, places such as this are as much about recreation (rafting, hiking, climbing), but for me the interest in going back sometime soon is primarily about the visual landscape, touching feeling and breathing the desert air, and hearing both the sounds and the silences. We head south from the Grand Canyon on US 180 to I-40 near Flagstaff. We take I-40 east to another of Arizona’s iconic locations, the Petrified Forest National Park. The eponymous petrified trees were created by combination of trees and minerals that were deposited over long periods of time and the gradual replacement of the organic matter with minerals. The relatively soft and easily eroded sandstone have left a surprisingly large number of these artifacts in one location. The extreme erosion patterns of the area also gave rise to the colorful formations of the Painted Desert. Leaving the park, we turn back west on I-40 to Flagstaff, and then head southward on I-17 towards the Phoenix metropolitan area and a very different Arizona. But along the way, we pass by Arcosanti, an experimental town and “urban laboratory” that began construction is 1970. It was started by architect Paolo Soleri to experiment with ways of developing urban environments that minimized the impact on the natural environment. The architecture of Arcosanti is quite unique. In addition to being an experimental project itself, it hosts a variety of events (including the annual Different Skies Music Festival). And it’s on to Phoenix. It’s hard to conceptualize that in the middle of the desert is one of the largest and fastest-growing metropolitan areas in the United States. Yet there it is. The recent rapid growth of Phoenix and the entire “Valley of the Sun” and the relatively flat terrain have led to some rather impressive highway interchanges. 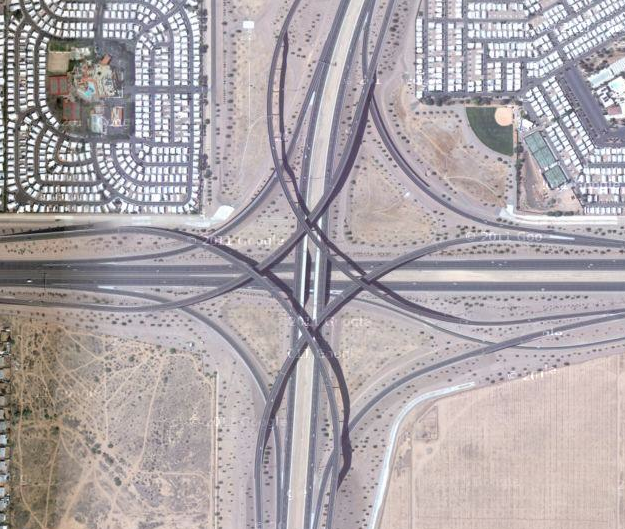 The rather complex tangle above is the interchange of I-10 (the Papago Freeway coming from downtown Phoenix), Arizona Loop 202 and Arizona State Highway 51, which is supposedly the busiest interchange in the state. A more elegant one (which I have in fact seen in a museum piece) can be found further east where AZ 202 meets US 60. The lines and curves complement the desert terrain (disregarding the subdivisions for the moment). Indeed, the structures themselves have a reddish color reminiscent of the desert landscape. Traveling up Arizona Loop 101 to Scottsdale in the northeast corner of the metropolitan are, one finds Taliesin West, the winter home and school of Frank Lloyd Wright. Wright designed this home to reflect “Arizona’s long, low, sweeping lines, uptilting planes”, aspects of the natural landscape which we have explored in this article. In ways, his goals predate and inform the work that continues at Arcosonti, although the latter has more of an urban focus. Heading south and east on I-10, we come to Tucson and a very different but still quintessentially “Arizonan” landscape. Here the most distinctive features are not the rocks but the vegetation, especially the saguaro cactus. Like the Grand Canyon, the saguaro is a symbol of the state, and of the best preserved tracts of these and other cacti can be found in Saguaro National Park west of Tucson. Heading back west on I-10, we switch to I-8 through the southwest corner of this southwestern state. We turn south on State Highway 85 through relatively empty but rocky landscape. Highway 85 intersects with 86 at the small town of Why, named for the “Y” shape of the original intersection of the two highways. Because Arizona law required location names to have at least three letters, the name “Why” was used instead of “Y”. Continuing south on 85, we eventually reach Organ Pipe Cactus National Monument. Although this park is named for the organ pipe cactus (shown above), it contains many of the other varieties found in southern Arizona, such as the saguaro. However, the converse is not true. The organ pipe cactus only grows wild here. I visited in the winter of 2004-2005 and found this park to be quite sparse and peaceful. The landscape does not really have many of the monumental rock formations further north, but it does have interesting hillsides covered with rough crumbling stone and frequently punctuated by the cacti. And I think the final desert sunset is an appropriate way to conclude this article. I of course know there is much more to consider in Arizona, and welcome thoughts and ideas from others as comments. Our “Primary Highways” series continues with a visit to Colorado. This edition is a bit different, in that I trace a family trip from a great many years ago, but insert more contemporary interests along the way. We initially entered from the northeast on I-76. The road was relatively straight here amidst softly rolling hills of the High Plains. The landscape is dotted with farms amidst open grassland. The Rocky Mountains appear to rise from the plains quite suddenly, as does the city of Denver. On that original family trip, we did not actually stop in Denver, but here we will do so. We turn south on I-25 along the edge of downtown Denver, passing through the interchange with I-70 known as “The Mousetrap.” We exit with US 6 which is surprisingly enough Sixth Avenue in Denver. Actually, it’s a freeway, the “Sixth Avenue Freeway.” Heading east in the freeway, it empties out onto city streets near the Santa Fe Arts District. A quick look at the websites for the galleries along the corridor suggests a relatively conservative selection, though I did see some interesting things from Sparks. Further north we find the Denver Art Museum. This building, which is just part of the museum, is designed by Daniel Libeskind, who also designed the Contemporary Jewish Museum in San Francisco and the plan for the new World Trade Center complex in New York. The shape of the building is intended to reflect the peaks of the Rocky Mountains, although such angles appear quite often in Libeskind’s architecture. In front of the museum, we also find once again another sculpture by Mark di Suvero, who we have encountered before in this series. This one is called Lao Tzu. The museum currently has an exhibit of Garry Winograd photography that I wouldn’t mind seeing. Further west, I-70 meets the mighty Colorado River and winds its way through Glenwood Canyon, which was my introduction to the southwest with its distinctive colors and rock formations. The difference from the eastern side of the Rocky Mountains and the peaks is dramatic. And while I loved the forested mountains, there is something personally compelling about the sheer red rocks. The highway itself is also quite a marvel, both in terms engineering and aesthetics as it attempts to be both functional and blend with the landscape. Along I-70 in Glenwood Canyon, one passes a turn off for a place called No Name. The community of No Name supposedly did not receive its name (or lack thereof) until the coming of I-70, when it was assigned to the exit because the area lacked a formal name. There is also No Name Creek and No Name Canyon, and a No Name Tunnel on the highway. I-70 and US 6 descend from the Rocky Mountains into the town of Grand Junction, where they meet US 50. One can exit the interstate here and travel on State Highway 340 through Grand Junction and Fruita to Colorado National Monument. The formations in the monument have this distinctive bottle shape – not unique to this location, but I noticed more of them there. Another thing I noticed there was an upper layer of rock, more gray than red, then seemed to have been gone from the more well-known canyons and formations in Utah and Arizona. It was also my first chance to see the rocks up close and personal, touch them and observe the details. From there, we took I-70/US 6/US 50 west into Utah. But, we later reentered Colorado from the Four Corners along US 160. The quiet and stark southwestern landscape particularly appealed to me then and still does now. We then headed north on what was then US 666 (the “Devil’s Highway”), but has since been renumbered as US 491. Honestly, I wish they kept the 666 designation. But it is what it is. The two highways separate in the town of Cortez, and one can continue on 160 east to Mesa Verde National Park. The Cliff Palace was is largest of the cliff dwellings in the park. The geometric shapes and layout still present in the dwelling are quite interesting. There are distinctive towers, one square tower reaching almost to the ceiling of the cave, and the round tower; and also the sunken round spaces known as kivas. One can see the parallels in these ancient structures to contemporary southwest architecture as well. I have not had much time to re-explore the southwest in recent years, except for a bit of Arizona, so I would very much like to return to Colorado sometime soon.